Free Shipping Included! 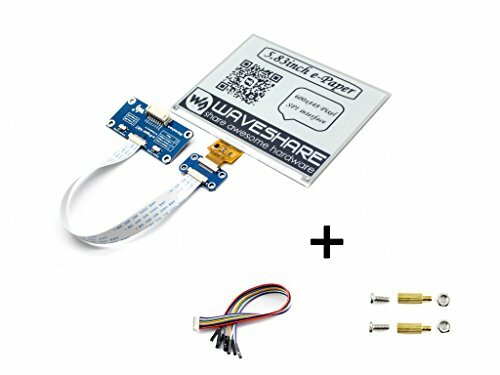 5.83inch E-Paper Display Hat Module 600x448 E-Ink Electronic Paper Screen Two-Color Black/White Compatible with Raspberry Pi Zero/Zero W/Zero WH/2B/3B/3B+ by waveshare at Pacs BG. MPN: 5.83inch e-Eink HAT. Hurry! Limited time offer. Offer valid only while supplies last. Overview This is an E-Ink display HAT for Raspberry Pi, 5.83inch, 600x448 resolution, with embedded controller, communicating via SPI interface. This is an E-Ink display HAT for Raspberry Pi, 5.83inch, 600x448 resolution, with embedded controller, communicating via SPI interface. applications such as shelf label, industrial instrument, and so on.